This was the blending of two projects of mine – Girl in Suitcase meets Spirited Bodies, and it was the first such encounter. It was not wholly successful for me, and for record’s sake, I will elucidate here the clearest positives and flaws that emerged. It was born of a desire in me to perform the play – Girl in Suitcase – somewhere new, as well as to enhance the familiar format of Spirited Bodies at WOW. WOW is the Women of the World festival, annually held at Southbank Centre, London in March, around International Women’s Day. It celebrates women and girls, and looks at the obstacles that stop them from achieving their potential. I went to the very first WOW in 2011, and pitched my idea of Spirited Bodies as a means to help women to feel more embodied, to an audience in the Royal Festival Hall as well as a celebrity panel including Annie Lennox and Sandi Toksvig. Jude Kelly, the artistic director of Southbank Centre offered to host one of my events there. It took a further 2 years to bring the actual event to the festival, and it has been a fixture ever since. I had not put on Girl in Suitcase since May ’15, and was itching to do so. It has in recent years been aired annually at Telegraph Hill festival, which is local to me, and I craved a new and interesting venue. I had put a lot of energy into creating the show with various friends in 2015, and then found their individual circumstances unable to commit further. Certainly that had been the case with Lidia, yet after working with her, I instinctively wanted to continue that sort of collaboration so didn’t attempt another. To add to that my personal life had undergone considerable turns in the last year; splitting up with a long term partner, and getting together with someone else. I was very keen to get back to the performance by the beginning of 2016, and as WOW has been the most high profile event I do in either project, I felt drawn to infuse that more with my own work. In previous years I had recorded interviews with models and artists in advance of the event, and edited them to play back during the session. For one thing my ex partner had the technical equipment for this aspect, and not unrelatedly, I wanted to ring the changes. 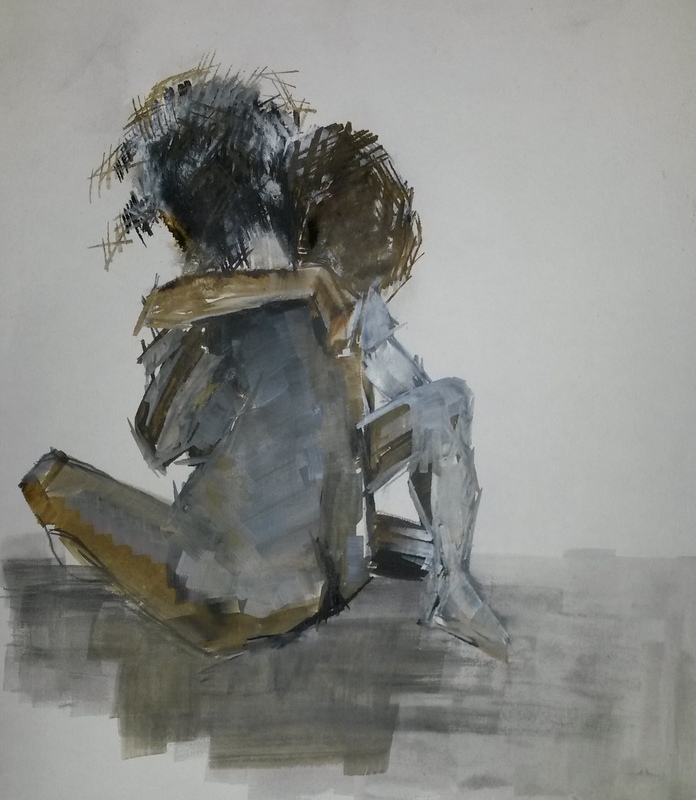 Aside from this, during the last year I really noticed how others in the life model scene may have overtaken me perhaps – some that I helped to start out. I was losing the motivation to simply exist in order to ignite other women’s careers. I mean, I wanted to help them, but not at my own expense. I essentially needed to feel at that moment, that Spirited Bodies at WOW was also for me, not just the benefit of others (it’s not a high earner either). A considerable flaw was I tried to fit in too much of the play; in the event there wasn’t time for it all, I had to cut big chunks whilst thinking on my feet. I had given myself too many details to focus on, and during the preceeding week I had gotten an inkling that this would be the case; it dawned on me that not all the parts of the play were so apt for the occasion. At the same time, since other performers were engaged I felt obliged to consider their needs, and not mess unduly with their already tight programme of learning the show. I was unable to perform my acting role with conviction as felt too plainly that the part did not fit; also my mind was elsewhere. 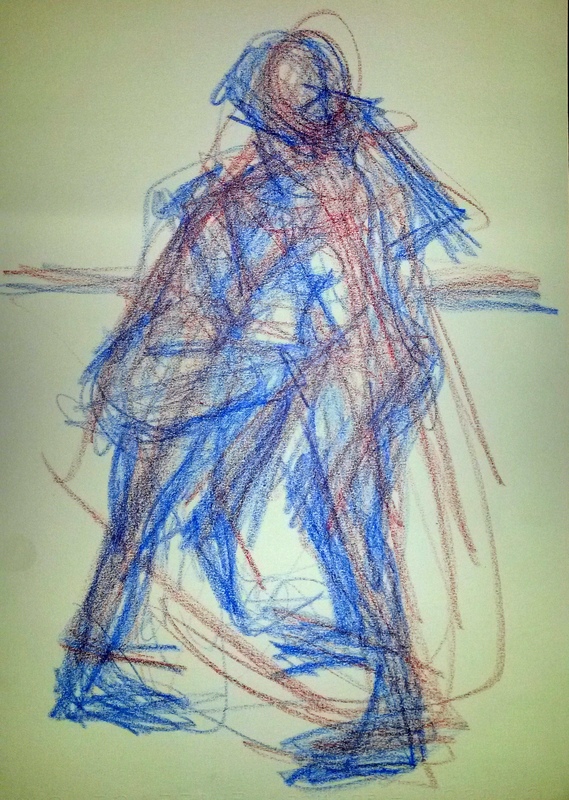 I’d had three Spirited Bodies workshops during the past week and supplies of drawing materials were suddenly low – I’d been a bit caught out it became apparent as the audience flowed in at WOW, and paper seemed scarce. Too many details! I knew that really my priority and responsibility was to the models, especially the new ones, but I had made it harder for myself to focus on them. On the plus side, the return to live interviews was a revelation. I had done away with this after our first WOW event in 2013, deeming the format unlikely to attract the truly nervous and hence some of the most magical and transformative experiences. In the meantime however, Spirited Bodies’ reputation has grown, and there is a bigger pool of people known to me for creating such a live event. Certainly at WOW, where the inherent safety factor is well understood, many more women are now willing to share their feelings live, whilst modelling. It probably helps that in the interim years, as Jude Kelly put it in one of her welcome to WOW speeches this year, “feminism has gone mainstream”. Live interviews means, genuine responses in the moment to the audience. There was some rehearsal involved, but it’s always fresh with an eager audience, and some parts have not been planned or scripted; they just catch you by surprise. The themed sections of the event came directly from the play, and represented the stages in woman’s life. This worked very well and provided ample pose ideas for the chorus, who were a pre-arranged group of models, ranging from some with much experience to total newcomers. The chorus created tableaux for each section (the Virgin, the Mother, the Enchantress, and the Matriarch), and these were being accompanied by other interacting action, like Sabine’s belly dance and Ursula‘s Gaia poem. The three of us – Sabine Zollner, Ursula Troche and I reading facts/statistics about violence against women, during a pose representing torture and witches burning, was very effective, making for a strong dramatic arc that deepened the experience. Everyone was reminded of the unfortunate plights of far too many women around the world. Cast in this light, any of our own bodily anxieties were hopefully more ready to fall away, if only temporarily. Regardless of any background noise in my own mind, the event was very successful. Having a well prepared chorus was powerful, and there were lots of new models trying out posing on the day from the audience. We had not had the room set out with an end-on stage before, more usually in the round, and this new lay-out actually worked well, elevating the chorus and action, so it felt more like a show. The event was well attended and well received, and I really appreciated the chance to add some theatre to Spirited Bodies. It was wonderful to revive the version from a year before, of Girl in Suitcase, that I had created with my two friends Sabine and Ursula. As ever, we were blessed with the support of regular women artists at this event, which I am especially grateful for, as well as the freedom to try new things, granted by the WOW team in support of my work.